I left Dixie Plantation and headed down US-17. The skydiving center was only slightly out of the way of my next stop, Savannah, but it made for a beautifully scenic drive – much better than driving down I-95. Traffic was light and the weather was perfect. I put the windows down and let the muggy air blow through my fingers. The Walterboro airport was only about an hour from Charleston, and since I stopped at Dixie Plantation on the way I was only driving about 45 minutes, which was nice. When I arrived, my GPS directed me to a little building in the back of the airport that was hidden away quite nicely. I didn’t see any parachutes in the sky or signs driving in so I was actually questioning whether I even came to the right place! Having gotten sketchy GPS navigation that took me on a wild goose chase for my home DZ before, I was a bit nervous, but once I took a walk around the building it was clear I was in the right place. I quickly found the manifest window, where they checked to make sure I was current and then allowed me to sign my life away. I met Bill, the DZO (dropzone owner) who gave me a briefing on the airport operations, landing fields, and aircraft. He showed me their Cessna 182s, which would be the smallest aircraft I’ve jumped from yet, with a capacity of 4 people! I signed up on the first lift, at which point I met Mike and Grant, who were on it as well. Another jumper got in with us and hopped out low. On our way to 11,500 feet, I got to know Mike and Grant a little better. At 20 years old with 250 jumps, Mike is the youngest skydiver I’ve met who isn’t a student or fresh off of student status. Mike and Grant got out and did their 2-way sitfly jump, then I waited 7 seconds and popped out to practice my B-License check dive sequence. On my second jump, 4 of us got in together and decided to do two 2-ways. Mike gave me some pointers for learning to sitfly, and then recorded me. The goal for a sit fly is to literally look like you are sitting in a chair. 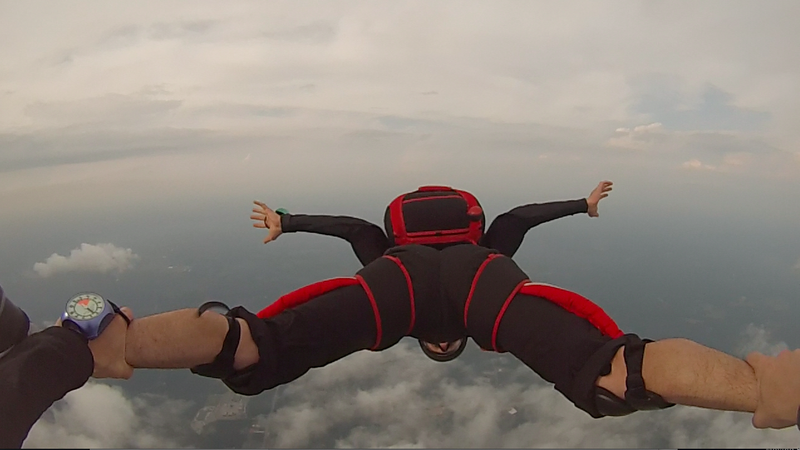 This position increases your speed from 120 mph in the belly fly position to around 160-180 mph in the sit fly. You can see in the video, I was close to getting right in it on exit, then I started spinning a bit so I had to focus on correcting the spin. Once stable again, I was almost there once more. Mike gave me some direction, were I to have pulled my legs up more I would create less drag on my lower half which would allow it to fall faster than my upper body, and put me in the correct position. It was getting late, but Bill (the DZO) allowed us to do one more jump. This time Megan, Mike and I were the only jumpers on the lift. We got in the plane and talked about our jump sequence. We decided that Megan and I would come out in a 2-way, then Mike would fly down and ride our backs like a surf board. As you can see, it didn’t quite pan out. Mike flagged Megan to break off from me, and at that point, it was just some skydiving hijinx. Mike flew in and grabbed my leg and shook me around (you can hear him grunting or something in the vid too). I wasn’t expecting that so I’m looking over my shoulder thinking, “What the Hell?? !” Eventually we broke off, and you can see our landing sequence. When I landed, Mike was kind enough to give me a pro-packing lesson, since all I know is flat packing. Pro-packing is quicker and takes up less space, and I’m looking forward to getting better at it. I was very grateful for the instruction!